Any marketer looking for more evidence of the power of the brand loyalist need look no further than their friendly neighborhood comic shop, particularly on a day like today – Wednesday. Because as any comic culture consumer will tell you (if you know how to ask), Wednesday is the day that the new comics come out. It’s been decades since the corner candy store with its spinner rack loaded with Spider-Man, Wonder Woman and Archie comics went the way of the nickel candy bar and Grape Nehi (though soda fans tell us that you can still find it in parts of North Carolina). Most comic books distributed across North America today are sold through specialty stores devoted to all aspects of comic fandom and related geek-centric passions. Independently owned and operated, these community-based small businesses serve as cultural centers and weekly rendezvous points for hundreds of thousands of pop culture enthusiasts. 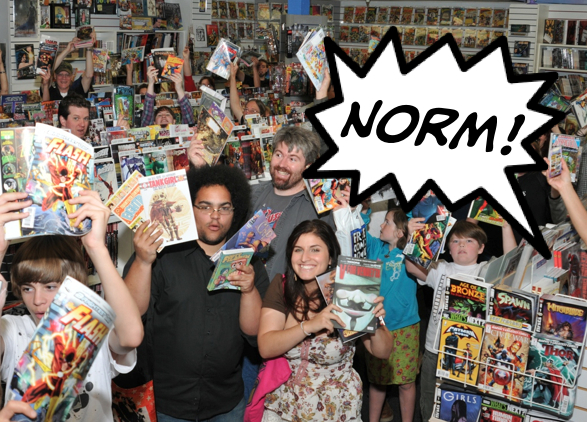 While much has been posted and reposted regarding the rise of digitally delivered comics and their importance in bring “lapsed readers” back into the fold, the vast majority of consumers in this sector value their weekly non-virtual comic shop experiences. In fact, according to data tracked and released by Diamond Comic Distributors, sales of comic books and graphic novels in the specialty retail channel grew by 15% in 2012. In an era where flat is considered up, this growth is somewhat phenomenal. Moreover, in a recent survey conducted among members of Bonfire Agency’s proprietary FanPan Pop Consumer Input Panel, 82% of respondents who read comics said they prefer to purchase them at their LCS (local comic shop) – and 66% of those (male and female) said that they feel their week is just not complete without their regular visit. With a tip of our cowl to the beloved Cheers, we call this effect the New Norm, for the best comic shops are very much indeed places where everybody knows your name. For marketers, this dynamic environment (with activity that persists throughout the week) presents unique opportunities to connect with an often difficult to reach, yet highly engaged and influential consumer target. But a few words of caution are in order. As with non-sparkly vampires, entry over this threshold is granted by invitation only. Brand stewards that approach such opportunities with respect and creativity will be embraced and the impact of their efforts will be magnified. All others will be tossed into the fiery pits of ridicule reserved for poseurs and brands that put capes on candy bars. Experience the experience for yourself. For the comic shop nearest you, ask the guy with way too many Batman statues in the office next to yours or go to comicshoplocator.com. Photo courtesy of Flying Colors Comics & Other Cool Stuff, Concord, CA.